I'm installing my Art Morrison IRS in my 67 Camaro. This version uses the upgrade Strange Aluminum differential with Dana 60 internals. 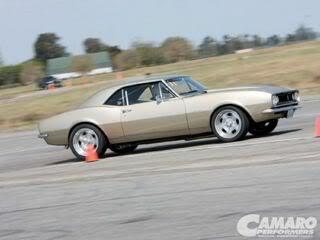 Art Morrison also has a Camaro diff version. Photos and notes to follow. Had to cut out the rear seat area for clearance. Leave a flange that can be bent to set a filler panel into. View from underneath with suspension in place. I may have to cut the floor more to clear the mufflers. This is the best area for mufflers. Last edited by David Pozzi; 10-08-2017 at 11:20 AM. Looks great Dave! I should try and head down for a visit one of these days. I've got one of these on order and I'm also planning to install a new trunk floor and minitubs. Any advice on the best way to go about this would be appreciated. I've been giving this a lot of thought but can't quite decide what would be best. Don, I needed to decide wether to do the IRS install first, or do the Mini-Tubs. I decided to do the Mini-Tubs after, thinking the tubs would go up against the frame rails & need to be welded to them. These rails don't toe-in like stock rails so they are around 3" wider apart at the front crossmember. I was told to leave the old frame rail spot welds & flanges so there would be more "meat" to weld to but they didn't line up with the new rails except for the area of the bend at the top by the shock mounts and only on the outboard side there. I removed them everywhere else. I'd do the trunk floor first, then the frame rails, then Mini-Tubs. I did find next to no flex once the frame rails were cut out. When I did Mary's second gen I was worried the unibody would shift around. I cut through the RH frame rail for the crossmember and the rear section dropped 3/4"! I was worried I wouldn't be able to push it back up to weld to the crossmember but it worked out fine. Other than frame rail removal, the only cutting needed was at the rear seat pockets where the seat belt anchors are & the trunk kickup. I'll post a photo of where I cut. You could install this suspension without removing your frame rails, but you would have to notch them out to install the crossmember, and plate the frame rails with 11 gage cold rolled steel on at least the inboard sides and bottom for at least 16" then locate and weld in the 4 cradle mounting tabs and upper shock mounts. The cradle & shock mounts weld to the frame rails. The trunk floor will have to be cut right above the gas tank strap anchors, a flange bent upward, then a steel panel inserted around 3" tall across the trunk. I cut and bent up the floor where it slopes down, will post photos when I get it done. Last edited by David Pozzi; 10-07-2017 at 03:36 PM. Looks Awesome! We’re glad to see you guy’s are in the Art Morrison family. Re affirms Jack and I are on to something here. I cut my tubs out, trimmed the trunk and inner wheel tubs prior to install the AM Tri-4 bar. Jack and I got it in and set up in one day of work. We installed the AM frame with the old crappy quarter panels on to reduce any body flex issues. Everything held together well on the frame rack. Very helpful pics. Thanks Cdog. Here are more pics of the progress. Note gap into trunk area where light is shining through. Last edited by David Pozzi; 10-07-2017 at 02:09 PM. Yes, I'll fab some subframe connectors. I'm trying to decide if I should attach them to the leaf spring mounting plates just ahead of the crossmember, then make filler plates to the crossmember, or to cut through the floor and weld the connectors directly to the crossmember. There isn't going to be access room to weld to the crossmember unless I cut a huge hole in the floor. That looks like it could take anything you throw at it! Dana 60 by Strange, Driveshaft shop axles, 930 style CV joints, ZR1 hub bearings, Axles are rated at 1400 hp. It should hold up. Last edited by David Pozzi; 01-27-2019 at 09:26 PM. Puzzling over how to route 3" exhaust around the fuel tank. The right side is a snap compared to the left. It looks like for a Rick's tank the lower edge should be moved rearward 1.5" to gain a little more room, the corners need to be lopped off like the DSE version. to allow room for the pipes to go around the corners. AME ran 2.5" pipes over the round tube next to the diff, 3" can't quite make it. Last edited by David Pozzi; 10-07-2017 at 02:10 PM. I'm doing trunk filler panels now, then on to the Mini-Tubs.